Constructed from an advanced material for this very technical and musical artist. The material allows the drumstick to be weight and density-controlled to meet a heavy weight specification. 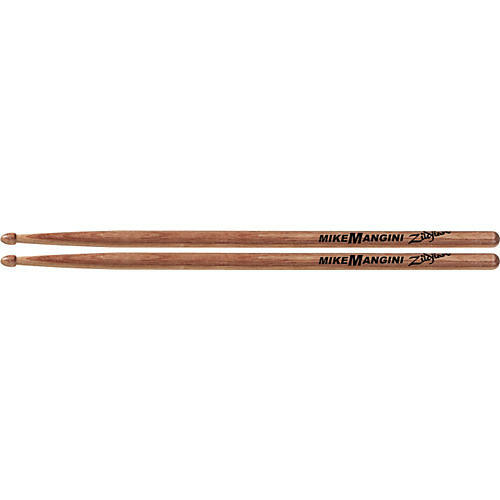 These sticks have an incredibly smooth and solid feel. The acorn tip produces a clean response. Mike presents his preferred pronunciation with "Laminated Bieerch" print under the Zildjian logo. As of October 1, 2009, all Zildjian Cymbals are guaranteed against manufacturer's defects for two (2) years from the date of original purchase. For warranty claims outside the U.S., contact your local Zildjian distributor. Click here for the international distributor locator. Cymbals that show factory defects within two years of their original purchase are eligible for examination at our factory. Zildjian experts will evaluate the damage and issue a replacement cymbal, unless it appears the damage is related to improper use or care. 1. Contact Zildjian to obtain a Return Authorization number (RA#), via telephone: 781-871-2200. 2. Indicate the location of the damage on the cymbal with a piece of tape. 3. Make a photocopy of your original numbered and dated sales receipt. 4. Carefully package your cymbal. Include your RA# and the photocopy of your sales receipt in the box. 1. It has been misplayed, dropped, played with excessive force or treated abusively. 2. The center hole is worn due to improper stand set-up or abusive play. 3. The cymbal was bought second-hand or used in a lease program. 4. The cymbal has previously been replaced by Zildjian. 5. More than two years have passed since the cymbal was purchased. • Cost of shipping a damaged cymbal to Zildjian is the customers responsibility. • Factory evaluations take approximately 4 - 6 weeks. • Cymbals that do not meet the warranty guidelines will be returned to customer. • Cost of shipping a replacement or damaged cymbal back to the customer will be covered by Zildjian.